I help the guy next door with his garden sometimes. 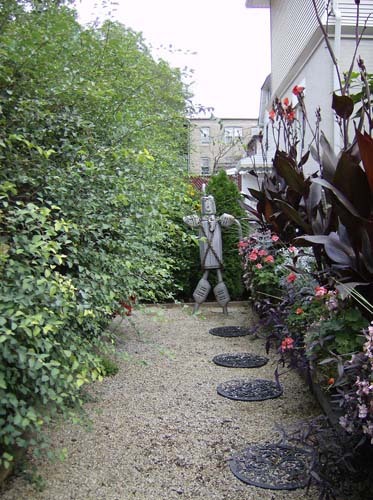 He gives me a few dollars a week to keep the flowers watered and stuff like that. I offered to trim the hedge but he says he likes to keep it like that to camouflage his workshop. He builds these, I don’t know, robot-looking things like the Tin Man from OZ in there. Some of them turn their heads or wave their arms, and when they move they make this really horrible squeaking sound. The first time I saw the inside of the workshop I was surprised I hadn’t heard the noise before, but he plays really loud classical music and that mostly drowns it out. The music stopped this morning. And then the robot things started walking. Luckily, they’re kind of slow. I locked the door, but the squeaking is getting closer. Remember back in March when I got my very first vintage fountain pen? I’ve been trolling Etsy vintage for pens since then (well, pens & train cases & bowler hats,) but nothing’s really caught my eye & budget at the same time until this past week. So now I have a second vintage fountain pen. Except this one is a part of a set. 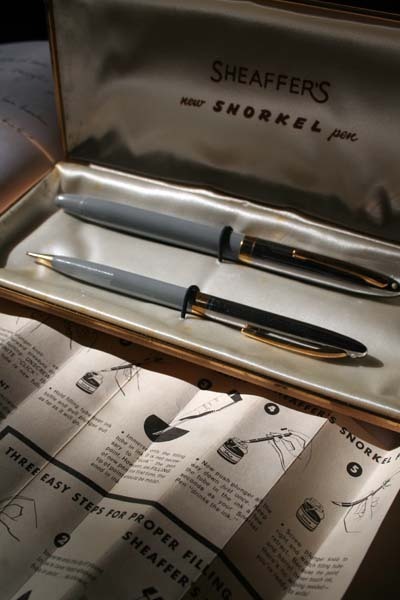 It’s a Sheaffer Snorkel Clipper Pen & Pencil set, complete with box & instructions. It has a really nifty filling mechanism that you can sort of see the instructions for in the photo & I kind of flailed around like a dork when I filled it this afternoon and the kittens thought I was weird. But that’s nothing new. This set is from somewhere around 1955-59 or so, and both pen & pencil appear to have never been used. I think this officially means I’m starting a collection. They always show up at the right time, even though they are most often unexpected. They always know precisely the right thing to bring. Chocolates or caramels or skeins of technicolor yarn. Glass bottles of cherry-flavored soda. Long stems of bright blooming flowers. They do not tell you who your gift is from. There is never a card. They refuse any offer of payment. 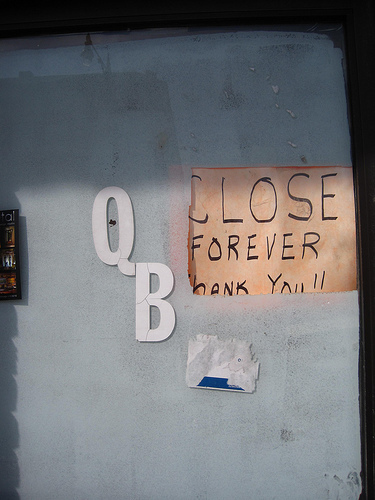 They simply hand the flowers or sweets or tokens to you, request politely that you add your name to the list of signatures they carry on a well-worn clipboard, and wish you well. 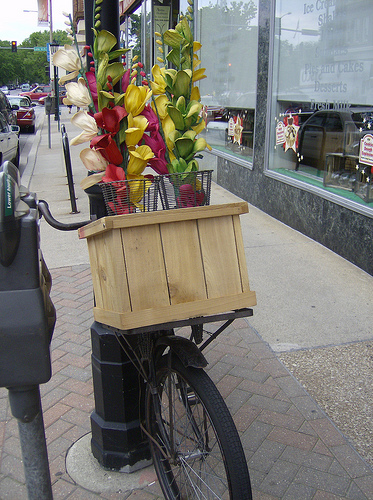 Then they ride off on their bicycles to brighten someone else’s day. My brain is too fried from revisionland & futzing with the blog layout for a proper post, so here is a miscellany of links to click on full of fun things I’ve encountered in the wilds of the internet recently. You know, when I haven’t been revising or futzing with the blog layout. Armor. For mice. And cats. Sia’s You’ve Changed video. I <3 this song already. Maru in a box that is too small. The latest pair of Fluevogs that I’m coveting. Beautiful Corgi who does not like the iPad. Also, I got a gargantuan box of yarn and bunnies and teapuppies in the mail today. I live in a world of whimsical wonderment. Seriously. I find advice in all sorts of places. In fortune cookies. On street corners. Sometimes even on the internet, but mostly out in the world. The universe has creative ways to get its points across, in filtered bits of text. Fleeting pieces of information to decipher. Some of it, I’m sure, was not even meant for me to find, but if it crosses my path I try to pay attention to it anyway. 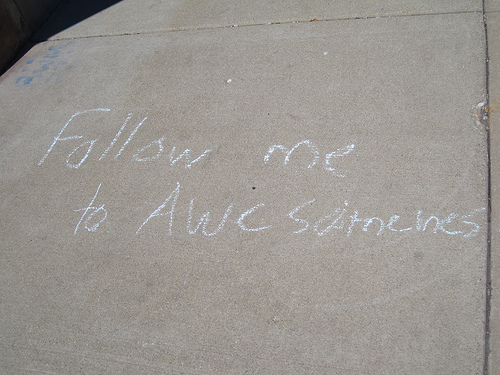 I follow it whenever possible. So far it hasn’t let me down. You find what you need to hear sometimes, if you keep your eyes open as well as your ears. I am completely useless this week. Multiple times over the last few days I have tried to blog and failed. Am severely lacking in focus. I have that disease where I can’t read, too. I have been carrying The Book Thief from room to room with me, putting it down on various surfaces. It’s sitting on the printer right now. I want to read it, but I can’t seem to get myself to just sit down and actually read. I have successfully made tea. Several times. I have pseudo-successfully started working on a redesign for the blog that will hopefully be implemented over the weekend. I got a string of little paper lantern lights that are now strung merrily over the iMac, making writing central a great deal more festive. If I remember to dig out my tripod later I will post a photo. I had an idea for an art piece and then was thwarted by the fact that despite having seven decks of playing cards, only two of them have jokers and they’re not the joker that I need. I think mostly I am biding my time (with relative degrees of success) until I can check back into the Revisionland Hotel. I’m planning on starting my additional changes next week, because I already have a list of things I know need changing and the rest of my beta feedback should be coming in relatively soon. I’m kind of looking forward to it, which is weird because I really thought I was suffering from revision fatigue, and now having taken a couple weeks off from it I really just want to crawl back into it. And now I have ignored this post without posting it for about an hour. Yeah. Things I Didn’t Expect About The Zombie Apocalypse, a numbered list. 1. Everything kind of stopped before anything really happened. You’d think things would stay pretty normal until the undead were knocking down your door, but everyone panicked way before that. As soon as it was even mentioned on the news people up & left. 2. There are a lot more ways to die, beyond the classic eaten by zombies bit, which I’m not sure should really count as a way to die. Is it a way to undie? I don’t know. 3. People I thought totally had it together were the first ones to flip out. If I’d have bet on who would still be here at this point back in the day I would have lost big time. 4. It’s been a really long time since the apocalypse and I still haven’t actually seen a zombie yet. 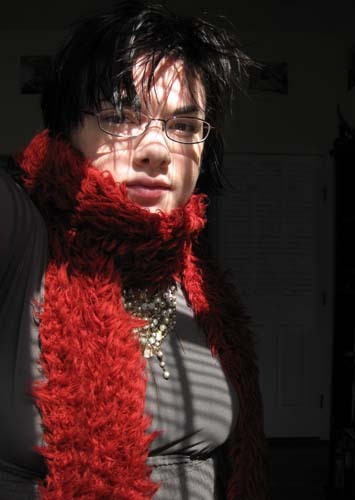 Hey, remember how about a month ago I promised photos of my new scarf that took me ages to knit? Apparently I’m just as slow at posting things as I am at knitting. Months ago now, one of my dearest far-away friends sent me a box of this gorgeous red wool eyelash yarn. I’m not particularly good at following patterns, so I decided to turn it into a fairly basic scarf. It’s actually more like a boa. And now that it’s practically summer out (seriously, it was almost 90 here yesterday), I have finally gotten around to modeling it in dramatic sunshine for the interwebs. It proved rather difficult to photograph despite the helpful sunshine. You’re just going to have to trust me that it goes down to my knees. I kind of love it. And of course, now it’s far too warm to wear it. I did wear it out once or twice in March, but it’ll have to wait until next year to get into heavy scarf rotation. Other than the fact that I am still coughing, after over a month of lingering chest cold, this weekend was lovely and springy. Not really knowing what to do with myself now that I am out of Revisionland for the moment, I thought I would bake muffins. But then I couldn’t find poppy seeds and I really, really wanted lemon poppy muffins. 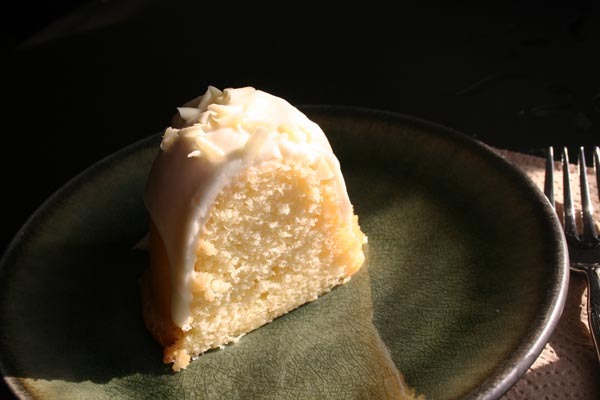 So while I wandered dejected and sad-faced through Whole Foods, the boy & I stumbled upon a tower of bundt cakes, and one of them was lemon with this lovely drippy icing and white chocolate shavings on top and we decided it was like muffins, but better. So we pretty much ate lemon bundt cake all weekend in the sunshine. It was really good. Likely better than any thwarted muffin attempt. While I had the camera out I tried to take photos of Tessa, and while she is usually a very photogenic kitten she was not particularly obliging this time. I set this photo as the wallpaper on the iMac and I keep laughing maniacally at it. 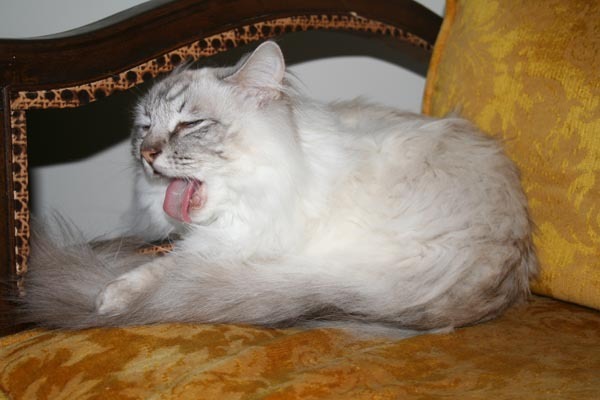 I think this was actually mid-tail-lick rather than proper yawn. I spent the cake-less, kitten-less hours of the weekend reading and cleaning the studio while the boy read the new revisions. Other than some minor things that still need tweaking, he really likes the major changes so that’s good. He’s read like, every incarnation of this thing and he’s a Virgo so I’m going to take that as a sign that I’m on the right track. Still have it out with other beta readers, so I’m going to try not to obsess over it while I wait and actually get other, non-revising things done for a change. Also, my windows are open and it is sunshiny and that is happy-making. 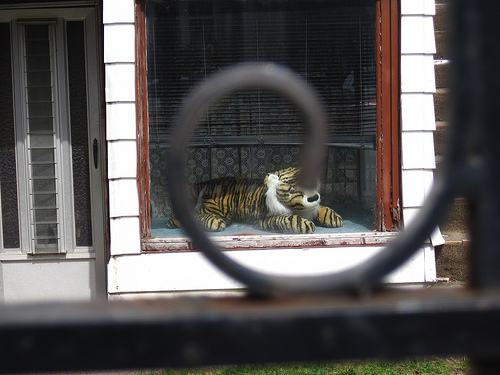 The kids that play outside make fun of the tiger in the window simply because it is there, and thus fodder for amusement. And the tiger cannot move from the window, so it is forced to watch and listen. It accepts their taunts with unblinking plastic eyes. The neighbor glares from her window across the way. It is impossible to tell if she glares at the children or the tiger or both. The tiger doesn’t mind. The tiger is patient. It knows that if it wishes hard enough, someday it can be a real tiger.